For IT News Week 2 Jun 2017. PR - Jun 13, 2017 - NY - Rakem launches PrivateKeys for its iOS and Android Messenger App. IBM today announced a new service, delivered via the IBM Cloud, for managing how employees gain access to their preferred business applications. IBM Cloud Identity Connect is a new Identity-as-a-Service (IDaaS) which helps provide users with rapid and secure access to thousands of popular cloud apps while enabling single sign-on (SSO) to all their applications, whether from the cloud or on-premise. As the workforce becomes more mobile, managing and securing multiple identities across their business becomes more complex on mobile and IoT devices, desktop environments and internet services. These complications are magnified as enterprises continue their journey to the cloud and try to bridge from their traditional on-premise tools and operate in a new hybrid world. IBM offers a family of tools for identity and access management under the IBM Cloud Identity brand. The portfolio includes a full spectrum of IDaaS offerings that provide seamless access to applications across cloud, on-premise, mobile and IoT devices and hybrid environments. The IDaaS solutions give enterprises access management capabilities born-on-the-cloud without sacrificing their existing investments. IBM Cloud Identity Connect will be available on June 15th in the IBM Cloud Marketplace. 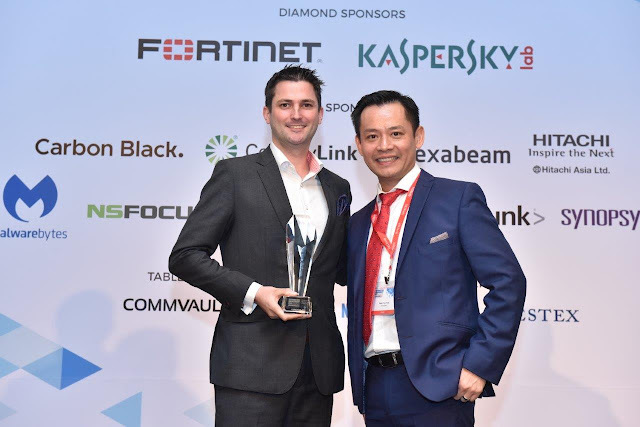 Carbon Black, the leader in next-generation endpoint security, has been named a joint winner in NetworkWorld Asia’s (NWA) Endpoint & Mobile Data Protection category at the Information Management Awards 2017. Carbon Black was also named a winner of the Top 8 Asia Pacific Security Vendors To Look Out For. Inaugurated in 2012, the NWA awards recognize Asia’s leaders and their technological advancements in information, security, storage, and data management. Guided by a team of experienced editors and a panel of more than 100 CIO advisers with domain expertise and deep insights in information management, finalists are judged on reputation, acceptance of technology, features, and USPs of the solution as well as end-user feedback. These awards reflect Carbon Black’s growth in the Asia Pacific region, where the company initially established business operations in 2015. Working with key partners across the Asia Pacific region, Carbon Black enables companies and governments to protect their endpoints and equips them to handle today’s advanced cyber threats. With the acquisition of Confer in 2016, Carbon Black has further built capabilities for organizations of all sizes to enhance their cyber defense and response mechanisms. Carbon Black has also pioneered a next-generation technology known as “streaming prevention.” Powering Cb Defense, streaming prevention was designed to prevent both malware and non-malware attacks by leveraging event stream processing, the same technology that revolutionized algorithmic day-trading. Rakem launches PrivateKeys for its iOS and Android applications for secure, encrypted and private texting services. The updated apps provide Rakem’s unique PrivateKeys feature. With PrivateKeys, Rakem bypasses the traditional keyboard, captures the user input before it reaches the operating system, locally encrypts the message content and sends the encrypted content to the recipient’s device directly. This prevents other installed apps and firmware installed apps on the device from capturing keystrokes. Even if a user has unknowingly downloaded an app that listens to keystrokes, which could be recording conversations while the user is unaware, PrivateKeys bypasses these apps – your conversation cannot be listened to or recorded by unwanted and unauthorized apps. Rakem PrivateKeys is the only messenger which bypasses keystroke recorders. Cyberview Sdn Bhd, the tech hub enabler for Cyberjaya has launched a platform to connect individuals with movers and shakers in particular technology spaces of expertise. Coined ‘Starter Kit’, the initiative aims to provide opportunities to individuals interested in ‘putting that foot forward and getting started’ by learning through insights from experts in various fields. 1 & 2: (L – R) Starter Kit panel discussion featuring Mr Mahadhir Aziz, Head of Technology Hub Development Division, Cyberview Sdn Bhd; Nadhir Ashafiq of TheLorry.com; Azlan Alam Malik of Otomate Me and Jeremy Chong of PrimeKeeper. 3: Tan Sri Dr. Mohd Irwan Serigar Abdullah, Secretary General of Treasury, Ministry of Finance who is also the Chairman of Cyberview Sdn Bhd engaging with the audience of the first Starter Kit session. The first installment of the Starter Kit series examined the hallmarks of an entrepreneurial mindset with three start-ups from the Cyberview Living Lab Accelerator (CLLA) Programme – Nadhir Ashafiq of TheLorry.com, Jeremy Chong of PrimeKeeper, and Azlan Alam Malik of Otomate Me. The panel shared industry insights and personal experiences with a diverse pool of students from Multimedia University. Tan Sri Dr Mohd Irwan Serigar Abdullah, Chairman of Cyberview was also present to engage with the students and later emphasised the importance of fostering the entrepreneurial mindset and spirit among students through the education system, regardless of their field of study. IBM and Universiti Pendidikan Sultan Idris (UPSI) announced the expansion of their collaboration on the Teachers TryScience program to include equipping special education teachers with lesson plans for 30,000 special needs students in Malaysian schools. Piloted in March 2016, IBM and UPSI collaborated to raise the proficiency of science, technology, engineering and mathematics (STEM) among lower secondary school students by developing lesson plans based on hands-on activities from IBM’s Teacher Tryscience program. Teachers TryScience program is a global corporate citizenship program of IBM, which aims to help teachers all over the world with more than 150 hands-on experiential lesson plans in addition to instructional strategies and guidance. Teachers TryScience uses innovative methods and practical work to enable understanding of scientific theories and concepts to spark students’ interest in STEM subjects. The Teachers TryScience for Special Needs and the use of the four lesson plans for special education was launched by the Ministry of Education’s Special Education Division Deputy Head, En. Wan Mohd Noor bin Wan Endut (pix enclosed) on May 25. The launch consisted of an exhibition of lesson plans innovated by Science teachers from the first phase of Teachers TryScience. More than 100 special education teachers and non-profit organizations working in the areas of hearing and vision impairments attended the launch.